This machine is the one I currently use in the home that I rent. Living in Las Vegas, NV, washers and dryers that are normally in the garage (as ours is), have to also handle the grueling heat of summer here. 110 degrees outside can easily get to 120 or 130 in an uninsulated garage, if not hotter. It looks to have been used for quite a while, but like a certain watch, it too takes a lickin and keeps on washin, if you'll pardon the joke. With a family of 2 adults and 3 teenage boys, we definitely need a workhorse, and this washer is that. With modes ranging from delicate to super wash, it has enough variety to easily handle all of our washing needs. For tough jobs, or, for those with sensitive skin, the extra rinse feature helps make sure that all the detergent is out of the laundry before putting it in the dryer or on the line. Smaller loads are also not a problem. The Performa also comes with a load size, so you aren't filling the entire machine for just a couple of items. Since we have lived here (almost a year) we have had no problems in it's performance. Sometimes four or five loads are done in one day, and never a complaint from the tough little machine. The only complaints I have about it are the bleach dispenser doesn't fully dispense and you run the risk of getting bleach in your next wash. Since we have found this out, we usually just add the bleach to whites manually, and leave the dispenser alone. The only thing I wish it had was an unbalance sensor to warn you that the clothes are out of whack so you don't hear it thumping away as it starts the spin cycle. All in all, if this model is available still (not sure if it is anymore), or if you find one used, definitely a good one to get. The new machines have a lot more bells and whistles, but with added features comes added complexity, and means easier for something to break. This Maytag is simple, and sturdy, and sometimes that's all you need. I have had this machine 9-1/2 years, and it has had three major (over $100) repairs. It has had a leak on and off for well over a year, and repairman can't find it--but I had to pay for service call. The machine is working, so we opened it up to see if we could find the leak, and the entire inside where the motor is has black mold all over it. Needless to say, it has to go. 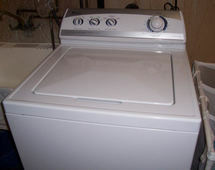 This is my second and last Maytag--the first one had a defective pump when it was delivered, and left water in the tub. I love my washing machine but does anyone else have a problem with the dark clothes coming out with lint on them and when they dry it is a nasty mess to get off?